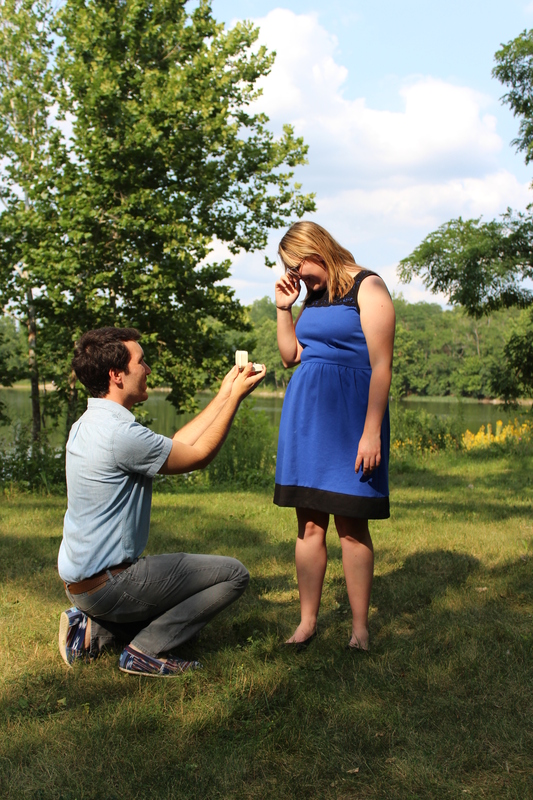 One week ago, I asked Stephanie Snay to marry me. We went to the IMA to see the Neo-Impressionist Portrait exhibit, and when we left, I said we should go for a walk in the 100 Acres. The weather was changing from the previous week’s pleasant October-in-July back into the muggy, blinding Indiana summers that we’re used to. I’m not the most orthodox guy, but some things you just have to do right. You can’t go wrong with the classics. I took my camera along, and took pictures at the goldfish pond and the Funky Bones statue to keep her from getting suspicious. When we made it to the lake area, we walked around for a minute before I decided the time and setting felt right. I kick myself a lot because I’m a perfectionist, and too many times before, the proposal milieu lacked. Really, I had the ring since the day before we went to Canada. I had this idea that I would ask near Montmorency Falls. But it was so close to the highway with muddy-looking water. Then I thought I might ask when we climbed to the top of Mont St. Anne. But we were wearing scrubby, hiking clothes, and every direction I turned there were power lines or ski lifts. The day we went to the IMA was perfect. It was our 4th anniversary as a couple, and Stephanie wore a beautiful dress, without any hint dropping on my end. So I said, “I want to take a picture.” And I set up my tripod, which is a laborious task. I put the aperture where I wanted it, set the timer to wait 10 seconds then shoot 10 consecutive images, and had Stephanie stand in just the right place. We stood under a tree, so all around her was shadow. I clicked the button once on her alone, then checked it. So far so good. I clicked the button again, and I stepped into the picture. Still good. 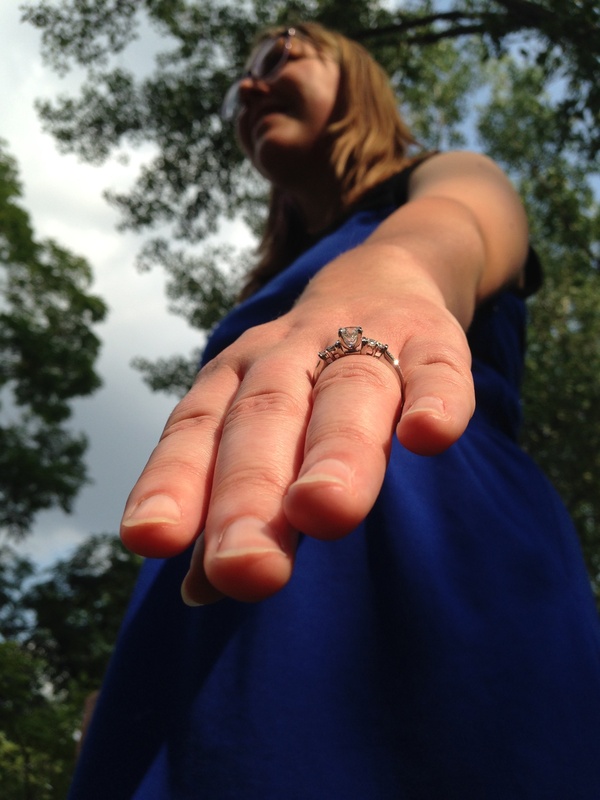 So I crouched down, pretending to adjust the camera settings and reaching into my camera bag to find the ring. Stephanie stepped out of the sun. “Are we almost done?” She said she was really hot. But she was still smiling, so I knew she wouldn’t kill me if I said: just one more. The camera’s shutter started to click. 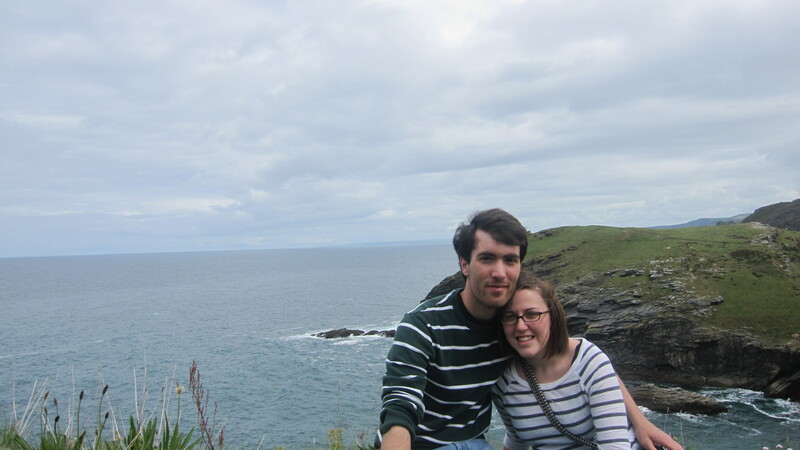 Here we are in Tintagel, England, on a 2011 spring term trip led by a favorite professor, a friend. I’ve asked Stephanie many questions before. Four years and some odd months ago, I asked her to hang out with me at Strange Brew coffee shop. We were friends. She’d just returned from Maine and was headed to France soon, so I, being a glutton for travel, wanted to hear all about it. We sat and talked, and I drank coffee. I asked her if she wanted anything, since I was working construction again and had money again, finally. She said no, that she wasn’t thirsty—when she was really just broke. We’d known each other for a few years at that point, but after that, I couldn’t look or think about her the same way. I knew then something I still, and always will, believe is true: Stephanie is my perfect person. She’s hardworking, intelligent, and great at what she does, which is anything she puts her mind to. She doesn’t give her friendship or trust away lightly, but when she does, anyone should feel honored to earn it. She will encourage, cajole—and drag you, if necessary—to be better. So over the following years I worked to be her perfect person. Within months of the Strange Brew incident, I enrolled in college and started seriously thinking about what I wanted to do with my life. For the past year, I’d been on one of those fabled “self-exploration” journeys. To find myself. Or whatever. What I saw, I didn’t like, and Stephanie listened and showed me, by example, that life is what you make it. And people—no one in particular—can be cat-wrangling journalists if they so desire. A year later, I transferred to UIndy. This May, I graduated. And I knew once that happened, I’d be ready to take the next step. The big one. I somehow concluded that Stephanie’s ring finger is the same size as my pinky. Well, it worked; I believe that’s why they call it science. Of course, she said, “Yes.” And we kissed and all that jazz. We walked around the 100 acres a little more, and talked about how long I had the ring. Then we stopped at the Broad Ripple Brewpub before making the rounds to tell our families. In this age, you have to tell everyone—anyone you tell, text, telegram—not to let the cat out of the bag on social media. The response we’ve received has been so overwhelming and amazing. So I wanted to say, Thank you, everyone (friends, family, coworkers, acquaintances, yetis) for being a part of our lives. We love you all. We’re excited and moving forward into the all-consuming furnace known as wedding planning. It looks rough, but getting ready to propose wasn’t the easiest thing either. Picking out the ring, finding the right time, and keeping it all a secret was a chore—a nerve-racking, stressful one, at that. But deciding that I wanted to spend the rest of my life with this girl was not. No, that was the easy part. ← O say can you see…?